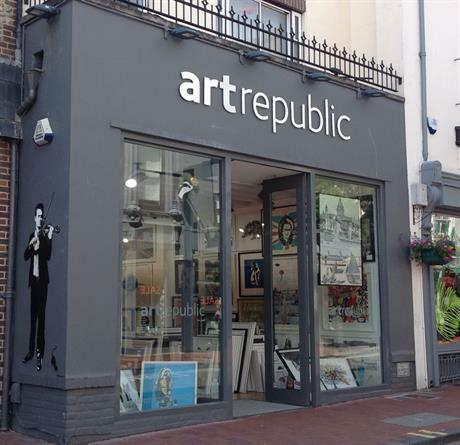 The annual Art Yard Sale in Brighton is brought to you by artrepublic, a local gallery that’s been selling contemporary art and limited edition prints for 25 years. Based on Bond Street in Brighton’s North Laine, our aim has always been to open the door to art in a way that's accessible to everyone – a goal that feeds directly into our annual Art Yard Sale, which runs as part of our sponsorship of the Brighton Fringe Festival programme. We were one of the first galleries to sell Banksy prints, and have become known for spotting young creative talent, as well as building relationships with established artists such as Sir Peter Blake and Damien Hirst. The artists who you’ll meet at the Art Yard Sale regularly work with us to exhibit, share and sell their work. You can find more of their – and other artists’ – pieces among our curated selection of limited-edition contemporary art prints at the artrepublic gallery, as well as on our website. Visit the artrepublic Brighton gallery pages at the artrepublic website.